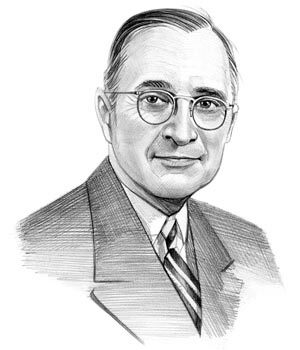 Summary of President Harry Truman for Kids: "Give 'em Hell, Harry"
Summary: Harry Truman (1884-1972), nicknamed the "Give 'em Hell, Harry", was the 33rd American President and served in office from 1945-1953. The Presidency of Harry Truman spanned the period in United States history that encompasses the end of World War 2 and the events of the Cold War Era - the age of the Space Race and the Cold War Arms Race. President Harry Truman represented the Democratic political party which influenced the domestic and foreign policies of his presidency. The summary and fact file of Harry Truman provides bitesize facts about his life. The article on the accomplishments of Harry Truman provides an overview and summary of some of the most important events during his presidency. The following Harry Truman video will give you additional important history, facts and dates about the foreign and domestic political events of his administration.